Custom Number One Light Keychains Personalized in Bulk. Promotional, Inexpensive. Bulk Number One keychain lights with bright White LED and fast production. The "Number One Light" will help make sure your company stays on top. Includes a long-lasting LED for years of dependable service! 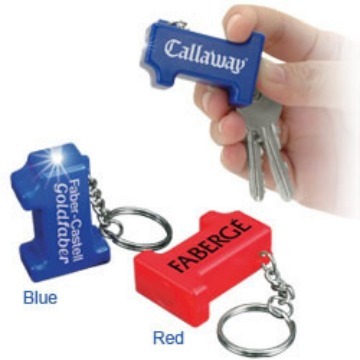 Budget Prices in USA and Canada for bulk personalized Number One keychain lights. American clients pay no taxes. Prices below include your 1 color custom imprint. The unit prices are for the standard production of 5 working days. Contact us for faster delivery. Product Size: 1 3/16" x 1 3/4"
Imprint Area: Body: 9/16" x 1 9/16"